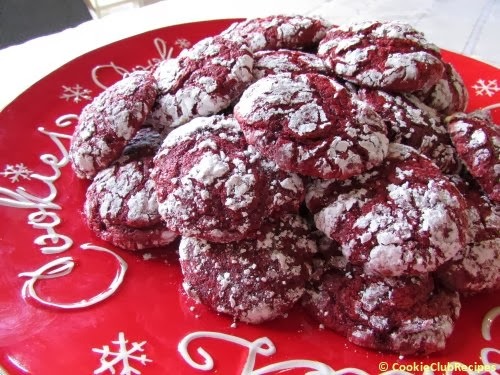 These moist Red Velvet cookies are made using our quick and easy recipe for Melt in Your Mouth Lemon Cookies, with only one different ingredient. Instead of using lemon cake mix, we used Duncan Hines Signature Red Velvet cake mix. When making up the batter we noticed it was a bit stickier than the lemon cookies, but we managed. The batter also did not combine well by hand so we folded the batter with our mixer on low speed. It worked like magic and turned a deep beautiful red. The batter was also just a little more difficult to drop by spoonfuls into the confectioners' sugar, but nothing to worry about. Again, we managed. If you like Red Velvet cake or cupcakes, you've got to try these cookies. They are like Red Velvet cupcakes smashed into cookies. They look delicious, and they ARE DELICIOUS!